she still had things to say. - Lyrics from Sara Grove's song "What Do I Know"
A friend from out of state recently lost her husband of ten years. He died suddenly in a motorcycle accident. She is now a widow at 33 years old, with five small children, (ages 8 years to 1 month). There were things left to say. My heart breaks for her every single day. I wear my grandmother's ring and when I look down, tears will sometimes fill the corners of my eyes. Losing her almost four years ago was very hard. Even today, I still have things to say. We may not understand death or have experienced it to the depths others have (losing a child, a parent, or a sibling.) We all know that death is a separation that hurts. If you've read "The Book Thief" by Markus Zusak, you know that the story is told through the eyes of death. In the book, it follows a young girl in the heart of Germany during the second world war. It is a book about living and dying. Although it was a very well-written book, with lots of good themes, the only hope it gave was: Live your best life while you can, until death takes you. As Christians, our best hope is found in scripture! I first came across John 14:18 in my search for scripture regarding adoption. If we study the context, however, Jesus is speaking to the disciples at the Last Super - right before He is to die. He is preparing them for His death, but mostly for His return to Heaven. He is going to leave them. They are going to be alone. I think of my dear friend with five little ones - alone. I think of my daughter in China - alone. My heart aches for those who are alone. My heart aches because I, too, have felt alone. We all have felt alone. What does Jesus promise His disciples? This promise is not speaking specifically of His Second Coming - although He will physically come again. This promise of "I will come to you" means the Holy Spirit. In just the next few verses we see: John 14:26 "But the Helper, the Holy Spirit, whom the Father will send in My name, He will teach you all the things and bring to your remembrance all things that I said to you." If we are one of God's children, we have the Holy Spirit IN US! We are not orphans! If we are saved, trusting in Jesus alone for our salvation, we are a CHILD of GOD! Rest dear one, plagued by heartache. God is not going to leave us alone. We may feel alone, but we aren't. We may seem alone, but we aren't. My daughter, sitting alone in an orphanage has a family. She belongs to us. We do not know her name. We do not know her face. Yet, she belongs to us. 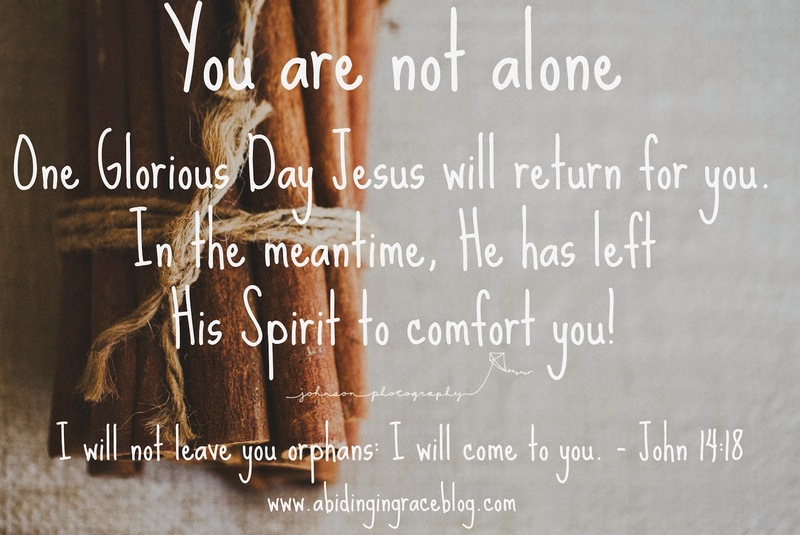 Dear daughter of the King - you are not an orphan. You belong to the King. He knows your face! He knows your name! You belong to Him.